From heavy hitters within the industry to the newest blogger, we are always humbled by the mention of our name. And each shout-out gives us an ear-to-ear smile as we continue to joyfully live the wine dream! “There’s no better time than patio season to enjoy these lighter-bodied, highly drinkable wines then now…2018 Epoch Rosé – Take time to smell (and taste) the rosé this spring! Taking inspiration from the rosés of southern France, Epoch’s pink has us all obsessed…” Click here to read the article. “Are biodynamic farming practices the wave of the future for Paso Robles winegrowers? Or is “biodynamic,” as some insist, hippy-dippy voodoo? Of late this form of alternative and conscious agriculture has entered the cosmos of Paso winemakers who claim to see considerable benefits in this holistic approach that ensures wellness of the soil and the vineyard. Click here to read all about biodynamic farming in Paso and to get Jordan’s two cents on the subject. “Known as the land of ‘cowboys and wine,’ Paso Robles charms with its unpretentious attitude, stunning scenery, and wide range of wines suited for every taste and budget…From farm-to-table fare to cozy vineyard inns, here’s our insider’s guide to eating, drinking, staying, and playing in the burgeoning region of Paso Robles.” Click here to see the full list that includes Epoch! “…Here at The Press, our team of wine experts has been busy visiting tasting rooms from Mendocino County to Paso Robles, determining which offer the highest-quality wines, the most fun experiences and the best bang for your buck…it’s a group of places that we think represents the breadth and diversity of California wineries and tasting experiences this year. 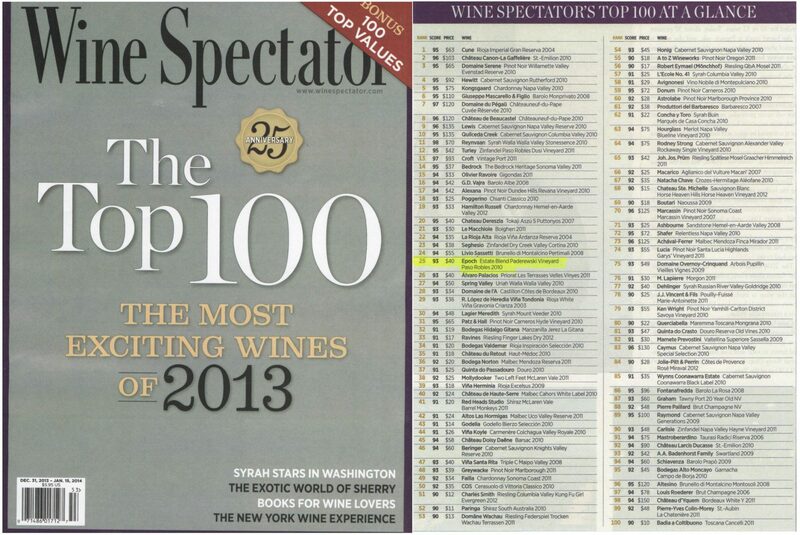 Click here to see the list of 52 wineries that includes Epoch! Top 100 Cellar Selections of 2018: 2014 Ingenuity is #53! “Each year, of the roughly 23,000 wines reviewed, only a portion (close to 4%) are designated Cellar Selections —wines that, while currently delicious, would benefit from being forgotten for some time in a cool, dark place in your home. This elite grouping is further whittled down to the Top 100 Cellar Selections list, a veritable cheat sheet for the most cellar-worthy wines on the market.” Click here to access the full list which includes ’14 Ingenuity as #53! “Superstar winemaker Jordan Fiorentini continues to keep Epoch Estate near the top of the peak in Paso Robles, and these latest 2015s and 2016s are some of the finest wines I’ve tasted from her. These are classic Paso Roble’s Rhône blends that mix the best of California sun and richness with a sense of purity, elegance, and balance. Don’t miss them!” Click here to access these scores and tastings notes. “Home to many reputable single-vineyard bottlings, California’s red blends are starting to take center stage. Here are our editors’ recommendations.” Click here to access the full article as well as 2014 Ingenuity’s beauty shot. “Literally no stone or brick was left unturned in Bill and Liz Armstrong’s quest to bring life back to the York Mountain Winery…” Read more of Vino Magazine’s ‘Featured Winery’ spread here. “…Under the watch of winemaker Jordan Fiorentini, the wines here blend ripeness and energy like few others in the region. They also age with unlikely grace given their richness and sheer heft…Access the full report and scores for Epoch here. “…In advance of the grape harvest (in the Northern Hemisphere, at least), Architecture Digest takes a look at some of the most beautifully designed wineries around the globe”…Epoch is listed as #2, and we are over the moon! Check out the amazing company we are in with their full list. “…this taut but generous wine, which effortlessly mixes power and finesse, makes a strong case for being the most impressive New World pink wine that I tasted this year. Hell, it’s one of the handful of best rosés that I’ve recently had, from anywhere…Read the full review of our 2017 Rosè here. “Today we’re toasting spring with rose, the latest ‘it’ wine. Wine expert Hayley Hamilton Cogill is here with the best the season has to offer.” Check out Epoch Rosé’s television debut here! LA Magazine’s guide to the Central Coast includes a nice write-up about Epoch and the York Mountain AVA as well as many other great stops in our neck of the woods. Check out their recommendations here. “Drowning in 90+ Point Wines!” Enough said. ; ) Check out Vegas Wineaux’s deep-dive into all things Epoch, particularly our use of concrete. Click here to access this blog post. “Mira Advani Honeycutt describes California’s Paso Robles wine region where the adventurous spirit of the Wild West is alive and kicking.” Read the full article here. “Favorite spots that treat guests like old friends.” Read the full article here. “At Epoch Estate Wines in Paso Robles, winemaker Jordan Fiorentini uses clay, concrete, and oak to ferment and age her wines, seeking specific characteristics from each.” Read the full article here. “The first wine grapes of the 2017 vintage are starting to be plucked from the vines in what growers are describing as a varied vintage.” Read the full article here. “Napa Valley and Sonoma get a lot of attention when celebrating great wines, however, California’s Central Coast also produces expressive, delicious and often affordable wines.” Read the full article here. “Reds, whites and green: a quick guide to some alumni vintners in the Central and Sacramento valleys of California, where in vino veritas is more than just a motto.” Read the full article here. “Summer is officially here, but please, put down the Rombauer Chardonnay. Our fair state produces a tempting and richly varied cornucopia of wines that are best enjoyed during balmy weather, and if you’re a true fan of the state’s wine industry you owe it to yourself to try a few that are less familiar and, at times, more adventurous.” Read the full article here. “Direct hop from Seattle to San Luis Obispo opens door for quick visits to Paso Robles wineries — less expensive and less crowded than Napa or Sonoma.” Read the full article here. “Central Coast winemakers pair their juice with preferred patties.” Read the full article here. “Among Paso Robles’ subregions, Willow Creek is one to watch.” Read the full article here. “With Mother’s Day this Sunday, we celebrate a few of the many hard-working moms of Paso Wine Country.” Read the full article here. “Ascension Winery, established in 1882 by Andrew York, was the first winery on the California Coast.” Read the full article here. “Anyone who’s spent some time in San Luis Obispo County will likely find something familiar about Epoch Wine Estates’ new tasting room in Templeton. The sleek, airy space is built on the bones of the old York Mountain Winery, established in 1882 as the county’s first bonded winery.” Read the full article here. The historic York Mountain Winery partially collapsed into a pile of bricks during the 6.6 magnitude San Simeon earthquake in 2003…A visitor to that site today will see the old winery morphed into an airy, modern tasting room, but with historic DNA of the original bricks, stones and redwood pillars. It’s the new tasting home for Epoch Estate Wines. Read the full article here. We are honored to be a part of International Wine Report’s list of Top 100 Wines of 2016. 2012 Authenticity made number 86 with a score of 96 points. It is in amazing company from wines all over the world. Check out the full list here. From steely Chablis to bold Rhône-style reds, this week’s Wine Spectator Insider has it all, with far-ranging new releases from California, France, Italy, Portugal and Spain, up to 95 points. This is a report of the most exciting wines our editors have discovered in the tasting room in recent weeks. Read their review of our 2013 Authenticity here. Ever taste a wine that made you say, “Wow”? We’ve long contemplated doing an occasional essay on those extraordinary bottles. Some wines are worth that extra scrutiny. The 2011 Block B Syrah from Epoch Estate Wines is such a wine. Read the full the post by one of our favorite bloggers here. Food & Wine provides a list of their favorites wineries to visit in Paso Robles, and we are honored to make that list! “Rarely do top-notch wines offer such stunning value as they do in this week’s Wine Spectator Insider, with momentous new releases from California, Oregon, France, Italy and Spain. This is a report of the most exciting wines our editors have discovered in the tasting room in recent weeks.” Read their review of our 2013 Ingenuity here. “In each issue, Editor-in-Chief Anthony Dias Blue selects a wide range of the best wines from among 500 he samples over the course of the month.” Read the Tasting Panel’s review of our 2012 Ingenuity here. “It’s no secret that Epoch Estate Wines is one of our favorite wineries. Epoch boasts premier vineyard sites, consistently excellent wines, and an enormously talented staff. We were excited to spend some time recently with one of that krewe, Associate Winemaker Peter Turrone.” Read the full article here. “Winemaker Jordan Fiorentini is making the most of her new winery on York Mountain, and her 2013s and 2014s are up with the creme de la creme of the vintage. In addition to the new releases, I was also able to do a small retrospective of her Tempranillo.” Read the full review of our wines here. “A winemaker with a heralded bio, Jordan Fiorentini has previous stints at some big names in the industry including Chalk Hill in Sonoma, Arauju Estate in Napa and Antinori Winery in Tuscany.” Read the full article here. “…The producers covered here and in the upcoming second installment of my rosé coverage made the best pink wines I tasted this spring…” Read full article here as well as Epoch’s 2015 Rosé review here. Check out Jordan’s interview with TV host, Scott Sullivan, of Prescott, Arizona’s Wine 101 “On The Road.” The 30 minute feature on Epoch can be accessed here. “Hit the hills for prestigious California wines and prime hospitality…the former cowboy town is a buzzing hive of wine coutnry tourisum, with enough activities to entertain travelers for an enter week…” Read the full article here. …stop by Epoch Estate Wines’ new tasting room, opening early this year. It’s a transformation of the historic York mountain winery, the Central Coast’s first winery.” Read the full article here. “…Totally balanced (in the low acid sort of way, which is what people pay real money for with Rhones…” Read the full article here. An in-depth and technical look at our winery! Give this article a read to learn so much more about us! “…thanks to two very savvy, upcycling investors and a tenacious young winemaker; Paderewski Vineyard and nearby York Mountain have once again become home to a sought-after Paso Robles brand, Epoch Estate Wines.” Read the full article here. We are beyond honored to have our Paderewski Vineyard make Tim’s 2015 List twice! Once with a beautiful review of our very own 2012 Zinfandel and a second time for the 2012 Saxum Zinfandel from Paderewski Vineyard. Read the full list here. …”built around 1890 and was home to several generations of the York family…Jan York who grew up in the old farmhouse… provided historical photos that guided the restoration and gave us inspiration…The original home, which was added onto over the years, stands at the center of today’s structure…” Read the full article here. “Standing beneath a nearly three-story-tall cut of exposed limestone, where sprigs of chaparral surprisling cling to cracks of life, winemaker Jordan Fiorentini makes me lick a dusty white rock, and the moisture vanishes from my tongue…” Read the full article here. …California Rhônes look enticing here, with Syrah and Grenache based picks from Tensley, Saxum, epoch and other contenders… We are thrilled to have five, yes five, of our wines reviewed in this issue. Read the full article here. …While uncorking, decanting, and waiting for a vintage Burgundy to open up can be a religious experience, it can be just as satisfying to discover a new wine from an emerging region. And if that whole discovery thing is what turns you on, then there may be no better place to get your fix than the Paso Robles wine region of Central California. Paso, as it is colloquially referred to, may be the most exciting emerging region in the country, if not the world…what makes Paso so exciting is the energy that is conveyed by a cadre of young and innovative winemakers… Read the full article here. …it was a relatively uneventful growing season, with a dry, mild winter and vines getting off to an early start in spring, a pattern that followed through flowering, set, veraison and harvest, where there weren’t any memorable heat spikes. Epoch’s Jordan Fiorentini said that even though the harvest was early, budbreak was even earlier, resulting in more grape hang time than in 2013… Read the full article here which also boasts three photos from our Paderewski Vineyard. …Fueled by bright and hard-working young vintners, the region is turning out an eclectic section of varietals and blends. Because of the variances of microclimates, a number of varieties that don’t normally do well in the same places are producing stunning examples… Read the full article here. Our very own rock star, Jordan Fiorentini, graces the pages of VINO Magazine where she is highlighted as one of six “Rock Star Winemakers” from the Central Coast. Read the full article here. The news is out about our new winery! We couldn’t be more excited to share this news with everyone. Read the full article here. Here at Epoch, we love the history both atop York Mountain, and in our Paderewski Vineyard. We are proud to be a part of this “trailblazing” wine region as we salute both the York Family and Paderewski while we create the next chapter to continue the legacy. Read the full article here. We always enjoy participating in the events held by the Rhone Rangers as it takes us out on the road to share Epoch wines with Rhone lovers! Check out this fun article by the WineCompass.com from a recent event in Washington DC! Read the full article here. “Upon exiting Highway 46 to York Mountain Road you feel as though you have entered an entirely new realm, as if transported to the deep south. The traffic drops off, Spanish Moss adorns the large trees overhanging the winding country road and you immediately relax into vacation mode. Best of all, Epoch Estate Wines is just ahead.” Writer Jonathan Cook captures all that is Epoch in this great piece. Read the full article here. With ties to Georgia, winemaker Jordan Fiorentini shares a few insights with this southern publication. Read the full article here. “The unincorporated community of Templeton, Calififornia, just south of Paso Robles, is a secret worth discovering.” Read the full article here. A Tale of Amazing Encounters. Beautiful Surprises. Every May in Paso Robles, the Paso ArtFest takes over the downtown park, stores and art studios. This year, friend of Bill and Liz Armstrong, and master artist, Quang Ho, will be traveling to Paso Robles to be the keynote speaker of the festival. Check out this fun read to learn how the Paso ArtFest, artist Quang Ho, and Epoch connect in this “tale of amazing encounters.” Read the full article here. “Syrah leads the way when it comes to Rhône varieties from the Golden State, either bottled on its own or, more commonly, in cuvées involving several grapes. This week, we highlight a trio of outstanding releases from Epoch in Paso Robles, a bastion for Syrah. In 2004, geologists Bill and Liz Armstrong purchased several hundred acres of land in Paso, including the historic 65-acre Rancho San Ignacio. They planted the estate vineyards to Rhône grapes, as well as to Zinfandel and Tempranillo. The Syrah comes from a specific block in the Paderewski vineyard, while the Authenticity and Ingenuity bottlings are both blends. Jordan Fiorentini makes the wines.” Read the full article here. A fun peek at what is happening on York Mountain! We are so thankful for our rockstar architect Brian Korte of Lake | Flato, hailing from San Antonio, Texas, as he and his amazing team are building our new winery and Tasting Room. This article gives a look at our dedication to preservation and restoration of the old York Mountain Winery. Though the story is anexious, our new winery will hopefully be complete for Jordan this coming Fall, and the new tasting room will open in 2015. Read the full article here. “…This quintet of winemakers, all under 40, are making their mark — and they all earned their chaps the hard way, pruning, picking, sorting and punching down. They buy their own barrels, drag hoses, operate forklifts, top off, bottle and do all the messy essentials of an industry often — and mistakenly — considered glamorous…” Read the full article here. “West Paso Robles is packed with so many impressive wine tasting experiences, it can be dizzying to decide where to sip. The grapes grown here yield exceptional fruit, and some of California’s youngest and most creative winemakers have left Napa and other highly decorated regions to practice their craft on this hilly stretch of coveted terrain…” Read the full article here. “No wine or region in 2011 escaped the unusually cool, often damp weather that hung over the growing season… California Rhônes are at the cutting edge not only of grapegrowing and winemaking, but also fo how Golden State producers markeet their wines… ‘…It made me quite happy knowing that Paso has gears and can also play the cooler-climate act,’ says Fiorentini…” Read the full article here. “One of Jeremy Dennis’s recent favorites, the 2010 Veracity from Epoch Estate Wines, comes from Paso Robles, where winemakers are making Grenached-based blends that Dennis says, are unlide anything I’ve tried before.” Read the full article here. “There are fine examples of old-vine Zin from Sonoma Valley, including Bucklin’s Old Hill Ranch Ancient Field Blend and Ridge Pagani Ranch, as well as newer sources such as Epoch Paso Robles Paderewski Vineyard.” Read the full article here. Four, yes four, Epoch Estate Wines are featured in the Jauary 2014 report of the International Wine Report. Wines reviewed are the 2012 Tempranillo, 2011 Estate Blend, 2011 Veracity, and the 2012 White. Read all the reviews here. “…My hightest rated wine of the year was the 2009 Epoch Estate Wines Veracity, Paderewski Vineyard. I rated that bottle of Veracity a 94, noting its goregous nose, juiciness, great black and red fruit, and long, savory finish. I loved it…” Read the full article here. “Each year, Wine Spectator editors survey the wines reviewed over the previous 12 months and select our Top 100, based on quality, value, availability and excitement. This annual list honors successful wineries, regions and vintages around the world.” 2010 Estate Blend made #25 on 2013’s Top 100. Read the full list here. “The 2011 Rhône-style reds from Paso Robles are a step or two off the pace of recent vintages. The late-ripening varieties that dominate the reds from this region, such as Syrah, Grenache and Mourvèdre, can be impressive, as demonstrated by examples from Epoch, Linne Calodo and Calcareous. But other wines are overly tannic, coming up short on depth and richness…” Read the full article here. “Andrew York, a rancher from Indiana who planted a Zinfandel vineyard in the late 1870s that eventually had him establishing Ascension Winery that later became York Mountain Winery. And while it can possibly claim the title of being the oldest continuously operating winery in North County, it can only say that thanks to being purchased by Epoch Winery in 2010. Epoch is in the process of resurrecting that vineyard and replanting it. This vineyard resides in its own 6,400 acre York Mountain Appellation. Epoch’s tasting room is located at the York Mountain site on York Mountain Road off of Route 46 West…” Read the full article here. 71. Epoch Ingenuity – This is a Paso Robles winery that has revived the Paderewski Vineyard with the help of consultant Justin Smith of Saxum. There wines are all stellar and this one is a blend of Rhone varietals with some Petite Sirah and Zinfandel mixed in… Read the full article.